Comparative modern recording: Rebecca Evans, Joan Rodgers, Jean Rigby, Nigel Robson, Peter Coleman-Wright, Waynflete Singers, Bournemouth Symphony Chorus and Orchestra/Richard Hickox (with Requiem) CHANDOS CHAN9515 [129:11] – reviewed as 24-bit download from chandos.net, with pdf booklet containing texts and translations. When the Beecham recording was reissued by Sony, Rob Barnett and Stephen Lloyd waxed lyrical in its praise (SM2MK8432 – review – review) but that wasn’t enough to defer the deletions axe: it’s utterly annihilated, even to stream or download. Though there is a Past Classics transfer, which I haven’t heard, that costs more than Beulah releases and Past Classics transfers tend to be of variable quality. All of which makes the Beulah an essential reissue for devotees of Beecham’s Delius. I recommend reading the reviews of the Sony CDs, as I have largely avoided covering the same detailed ground. This is where I have to admit that I have never come to terms with this work: the EMI set containing Sir Charles Groves’ recording, though highly praised and conducted by one of my musical heroes, lies untouched somewhere in the inner recesses of one of my CD cabinets. Though I’ve never denied that the work contains some beautiful music, I have tended to find my attention wandering, as I do with Schoenberg’s Gurrelieder, a work of similar epic proportions. The problem is not just Delius’s militant atheism, which is even more apparent in the Requiem of 1916 which I like, especially in the Hickox recording, or the tediousness of the words from Nietzsche, though I never had the patience to read the whole of Also sprach Zarathustra. Hickox beats the odds and comes closer even than Groves to persuading me to like the Mass of Life, with a fine recording of the Requiem thrown in, and I can recommend this version to anyone in search of modern sound. It’s available for download in both 16- and 24-bit formats, the latter comparatively inexpensive as such downloads go, at £22.99: the CDs cost around £25. Even so, I’m likely to visit this more for the sake of the Requiem. Don’t expect anything like the same immediacy of sound from the Beulah reissue. The problem is inherent in the original; though Rob Barnett thought the ‘haze of far distances and shimmering cordilleras’ not inappropriate for the music, with no lack of impact where required, Columbia in 1953 were not producing anything like the quality achieved on the EMI recordings of Beecham’s Delius just a few years later (see Beecham conducts English Music below). I got to know a great deal of Delius from Philips and Fontana transfers of those US Columbia tapes before the rights reverted to CBS and those LPs left a very great deal to be desired, though the performances shone through. It’s from one of these LPs that the Beulah transfer has been made and my link to the release came with an acknowledgement that the original had been difficult to work with. 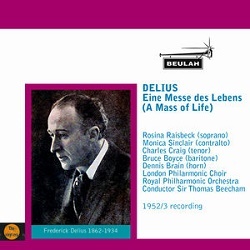 Not surprisingly, despite Beulah’s achievement of making some even earlier Supraphon Talich recordings sound better than I have ever heard them – review – listening to this Delius soon after Hickox does show up its shortcomings. Such a close comparison, of course, highlights deficiencies which would not otherwise be apparent, which is why I’m often sceptical of the Building a Library process, but I do caution potential listeners against too high expectations. That’s particularly a problem with the louder choral passages, where there’s an unavoidable degree of blasting, perhaps anticipated by the engineers in offering a more distant sound: solo voices and orchestra sound much more up-front and more natural and for most of the time the sound is very acceptable. Rob Barnett admitted to a degree of the ennui that I’ve expressed when listening to recordings of this work. If you have shared that feeling or if you have yet to hear the Mass of Life, Beecham is the man to convince you, if anyone can, despite the comparative shortcomings of the recorded sound. At the moment only iTunes have the download, but when this reissue appears on Qobuz in due course I recommend subscribers to sample it there. Indeed, Beulah have recently transferred their recommended download site to Qobuz, not only because it offers subscribers the opportunity to stream first but, more importantly, because it offers a choice of lossless formats, including the pure wav format in which these reissues reach me and at the same price as iTunes and Amazon, who don’t even employ the full potential of mp3. There are no notes or texts with Beulah downloads but the Hickox booklet is free to all comers – here. All in all, then, Beecham works his usual magic in the Mass of Life, as always with Delius, and helps convince me of the value of a work which I have undervalued. That makes this an important adjunct to Sir Thomas Beecham conducts English Music, a budget-price 6-CD set almost wholly devoted to Delius (9099152 – review – review). Snap that up if you haven’t already done so before Warner delete it: their single- and 2-CD collections of Beecham’s Delius (5675522, mid price, and 0946532, budget price) are already download-only. Then go for this Beulah reissue: a convincing performance of a work which I have never before come to terms with in a very decent, though dated, transfer.